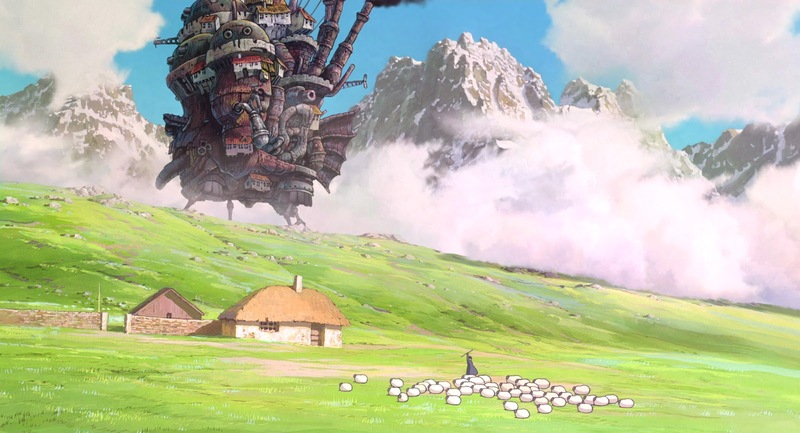 Studio Ghibli Fest 2017 concludes with Hayao Miyazaki's 2004 sprawling epic Howl's Moving Castle in theaters on November 26, 27, and 29. This will include both "dub" and "sub" screenings, so everyone will be able to enjoy this great movie. Of all the Studio Ghibli films, I feel that Howl benefits the most from the big screen. Miyazaki paints with a wide canvas, he fills the edges and corners with little details and grand, sweeping gestures. Its episodic structure reminds me greatly of the Nausicaa books, which made radical shifts in tone and style as its story progressed. This is Miyazaki at his most lavish and self-indulgent. Many people at the time were thrown off as a result, especially fans of Diana Wynne Jones. I don't think they were expecting an adaption of Howl's Moving Castle that chucks half the plot, kidnaps the characters, and then just runs on a wild tangent. But that's what Miyazaki does, and it's something you will either love or hate. My frame of reference is Horus, Prince of the Sun and Heidi, Girl of the Alps. I'm from Miyazaki's corner of the world, so I can recognize his archetypes and themes. These may not match perfectly with the movie's source material, but the same could be said of Alexander Key's The Incredible Tide, a sci-fi novel that served as the foundation for Future Boy Conan (a Miyazaki and anime classic that neither Miyazaki nor anime fans want anything to do with). I love the romanticism of this movie, the earnestness of its characters, the lush colors and details of its settings, the bold and varied color palettes. Sophie is the ideal heroine for this picture, a person who is transformed from a young girl to an old woman and back again. By the end of the movie, she is her younger self, but retains her 90-year-old shock of white hair. She is the embodiment of her experiences, paradoxes and contradictions. She's just like that enormous, lumbering castle in that sense. This is a great movie. You should watch it. I know it will take you away from your phones and your digital sugar pellets, but trust me, you will survive and be better for the experience. Please visit the Ghibli Fest website to find the nearest screening in your city and to reserve tickets. Why do anime fans and particularly Miyazaki himself want nothing to do with Future Boy Conan? I loved it and thought a lot of other people (of the few western fans who've actually seen it) did as well. The only explanation I can think of is that it was essentially the framework for arguably more well-realized and executed works on Miyazaki's part (not that I necessarily agree with that). Josh, I think for the anime fans at least, it's an aversion to older media. The 1970s may as well be prehistory as far as they are concerned. They assume anything made before the 1980s (in some cases, the 2000s) is not worth their time: it MUST be corny and poorly animated! It's a shame. I would love at least a DVD release of FBC; it is a classic series. Sure, Castle in the Sky is a more "mature" take on its character archetypes and themes, but the longer format of a miniseries gives it more time to let its characters develop. They're both great works of art.